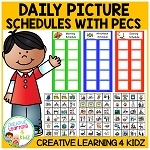 These are wonderful church-related PECS to use with any child, especially the visual child. 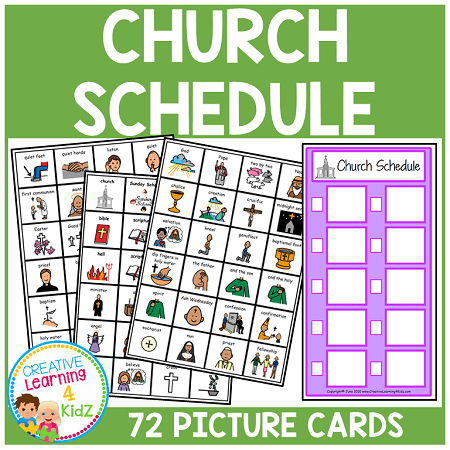 These can be used to create a schedule, give visual cues, and teach about the church. The schedule has small boxes beside each PECS space. They can be used to number or check off task with a wet erase marker. Church PECS include: Jesus, sermon, choir, pew, pray,communion, believe, love, altar, (2) scripture, sing, bible, sin, Sunday school, church, cross, offering, heaven, hell, minister, angel, (2) hymn, God, Pope, Noah, two by two, chalice, creation, crucifix, midnight service, salvation, kneel, genuflect, baptismal font, dip fingers in holy water, the father, and the son, and the holy, sprit, Ash Wednesday, confession, confirmation, eucharist, nun, priest, fellowship, quiet feet, quiet hands, listen, quiet, first communion, saint, usher, wine, Easter, Good Friday, sister, Holy Spirit, priest, brother, Virgin Mary, bishop, baptism, Bible study, blessing, candlesticks, holy water, rosary, Ten Commandments, and give thanks. The purchaser is granted permission to download and print this item for noncommercial individual or single classroom use only. This file and finished product is not to be shared or resold.